Are you ready to shake up the routine? Try our 21-Day Transformation for only $59 (member discount) and $89 (non-members). 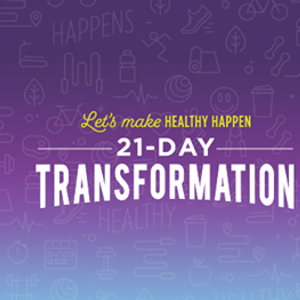 The 21-Day Transformation will provide an easy plan to follow for workouts and meal planning. Enjoy working with your very own trainer who will personalize your plan for you and provide daily motivation both in and outside the gym. Get ready to have fun, improve your fitness level and see real results. 1st, 2nd and 3rd place prizes and a whole lot of fun! Starts on April 15th at the N. West Ave location and April 16th at the Page Ave location. You can attend sessions at both locations. Limited spots available for each trainer.